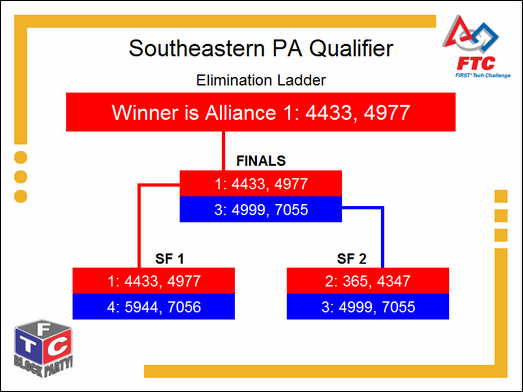 This team has the ability to motivate and “transform” themselves and those around them to FTC enthusiasts. Their scouting team looks to build bridges, sharing and helping other teams whenever they can. We never heard them (Brandy) “wine”, quite the opposite. This team out shines all other in this category. They started off as a team in the basement and have traveled far to connect with their community. They have mentored, created, and recruited, leaving a legacy of teams in their wake. They used risky materials for their robot, no other team would have thought of. After a rocky start, they really came together to earn this award. This team blinded the competition with their sunny personality. This teams design was influenced by cubism. Encased in plastic this team is fantastic! This team has a sister team that they work with. Their robot has a lift for easy access. The Inspire Award is given to a team that bow best represented a role-model FTC Team. This team was a strong competitor on the field today and placed high in every judging category. They are very included in community relations. They have a strong social network presence to promote the FTC values in all their endeavors. This team is a solid contender in many areas, including connectivity with the community, effective communication skills, teamwork engineering and design. This team embodies the spirit of the FTC and FIRST organizations. As a result, the "Block Solid Award" is presented to 6508 Radioactive Raiders.